I have already talked about social media tools to automate the social sharing process. Today I will talk about social media tool call ViralTag. I am using this tool now and its a great tool to use to share on social networks. Social media tool help you automate the social sharing process and save time. If you like visual content then you know that others also like visual content of your site and Viraltag allow you to share visual content of your site with social networks. ViralTag is offer free service for 3 social-media profile twitter, Facebook and tumblr. You can schedule up to 200 posts/month. 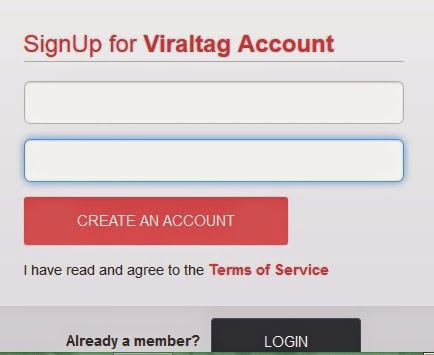 So today you will see how ViralTag works and review of ViralTag. You can start using viraltag free plan. You can add 3 social networks. Viraltag help you share on Tumblr, Twitter, Facebook Profile and Page, Pinterest and LinkedIn. The best thing about this tool is that it allow you to add images and share them on social profiles. I personally like the feature to upload multiple images from web or computer and easily schedule them. Enter email id and password to create a free account. Now you will see accounts, click on "connect to connect it with your social account. You can easily upload so many images with just one click and schedule them. You can add unique description to images or can use same description. It help you put your social media profiles on autopilot. You can also see various categories that show visual content and you can use it to find ideas. Viraltag also allow you to set time to share images, which is good if you want to share images on some particular time. You can use gif images as on twitter gif images attract more retweets and get you more followers. GIFboom help you to create .gif images. ViralTag is a great addon into list of social-media tools. “Visual content” makes it unique and valuable. you can also use their extension for Safari and Chrome to add new post from anywhere in the web. Using Viraltag is a good experience for me. You can schedule bulk images and it is good for pinterest and gif images is good for twitter. Do share if you are already using ViralTag. Also share any social media tool to share visual content? If you enjoyed this post, do share on Facebook, twitter and Google plus. If you have any question, feel free to ask me. Don`t forget to like us on facebook and subscribe eAskme newsletter to get free updates.